Let your supporters email politicians and decision makers with one click. That's what Vox does, and we've built it just for you. Easy to setup. Easy to use. The tools you need for your cause. Vox just works, right out of the box. Connect your supporters to any decision maker you want. Just add your target's email address and we'll take care of the rest. 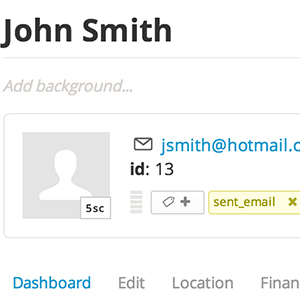 Capture your supporters email addresses through Vox. Integrate with popular email marketing services, including NationBuilder. Vox uses a CASL-compliant email opt-in. Track how many supporters are taking action and how many emails are sent. Get a clear understanding of how your campaign is performing. Setup your organization on Vox and let your entire team collaborate on campaigns. 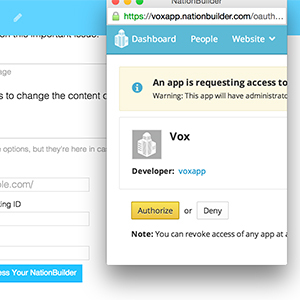 Vox works seamlessly with your NationBuilder Nation. Can I sign up my whole team? Yes, absolutely. Anyone on your team can collaborate on campaigns using your team's login. We'll soon be launching multi-user organizations, so everyone on your team can have their own account. Stay tuned! Can I use Vox with my existing website? Yes. 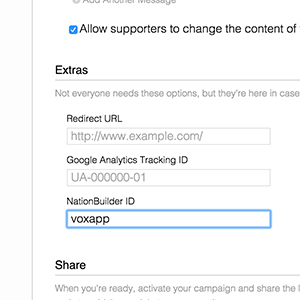 Easily add your Vox campaign anywhere on the web with a simple embed code. You can also link to your Vox campaign hosted on our server. How long does it take to setup a campaign? Less than 5 minutes. It's really straightforward. We have made it as easy as possible so that you can spend time on what matters: finding and mobilizing supporters for your cause. Do my supporters have to send my template message? It's up to you! You can provide supporters with a template message and allow them to edit it or not. You don't have to provide any message at all if you want your supporters to write their own! Are there contracts? What if I want to cancel? Nope. Sign up for month by month service and cancel any time you want. If you think you'll stick around for 12 months or more, you can also pay for a year up-front and get 1 month free. We're here to help! Just email us at [email protected] and we'll be happy to lend a hand! Questions? Need help? Email us at [email protected] and we'll be in touch ASAP.